His last name jumps off the page, much like the term shrapnel usually does when leaving an artillery piece. Either definition brings to mind images of death, destruction, maiming, and killing for any military historian. Yet, why is it attributed to Henry Shrapnel? Born on June 3, 1761, the ninth child of Zachariah and Lydia Sharpnel, Henry grew up at Midway Manor in Wiltshire, England. By 1779, shortly after his 18th birthday he joined the Royal Artillery and the next year, after gaining his commission, was assigned to Newfoundland to protect the vital harbor of St. John. Four years later, as a first lieutenant he finalized an invention called “spherical case ammunition.” This new artillery shell was the hallowed-out cannonball that would explode in mid-air and rain lead shot down on the enemy. In 1787, at Gibraltar, Shrapnel had his first successful demonstration of this new shell. He further perfected the idea, testing the fuse, using a hollowed-out spherical shell design, and using various amounts of gunpowder. 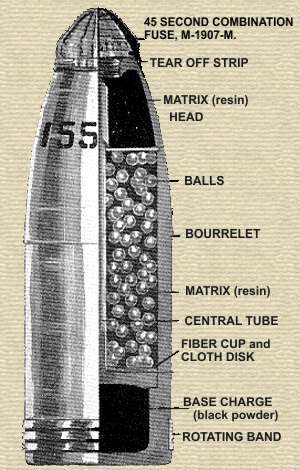 In conjunction with canister, in which the shell would explode as soon as it left the canon’s mouth, spraying lead balls at close range on the enemy, Shrapnel’s invention surpassed the distance and fragmentation (the exploding of the outside shell) of any previous design employed by the British. In fact, depending on the cut of the fuse and gunpowder and/or explosive charge, Shrapnel’s new artillery shell invention could rain havoc on an enemy at 1,100 meters or over 3,600 feet! In one test, “more than one-third of the number of balls fired from the guns” in which “ten rounds were fired from two 5 ½-inch howitzers, four light twelve-pounders, and four light six-pounders, in thirteen minutes” found their mark. Three targets representing dragoons or cavalrymen was set at around 1,920 yards. In an amazing set of fireworks, “3998 balls and 24 splinters of shells struck the three targets.” That was only one-third of what was placed in the fired shot! The above test was recorded by Sir John Sinclair, and given as testimony by his son in an appendix in Observations of the Theory and Practice of Shrapnel Shells, or Spherical Case-Shot by Major R.S. Seton published in 1854. The British military adopted Shrapnel’s shell in 1803 and was immediately put into use as Great Britian fought on the European continent and around the globe. At the Battle of Surinam, in South America on May 5, 1804 the British used Shrapnel’s invention against the Dutch, whom promptly surrendered when these projectiles wreaked havoc on their battalions. The shell also played a role in the pivotal victory at Waterloo on June 18, 1815 when the British used it effectively against the French and Napoleon Bonaparte. Although the mud due to the incessant rains that blanketed the area on the prelude to battle dampened the effectiveness, the spherical shells still caused havoc and destruction among the French infantry attacks. In fact, the British called it their “secret weapon” during the Napoleonic Wars as the French struggled to replicate the invention. Unfortunately for Shrapnel, who sunk a lot of his own money into the invention, he was never fully reimbursed by the British government and the crown he served. Initially turned down in September 1813 by the Board of War, he finally was granted a modest pension for the invention in 1814. 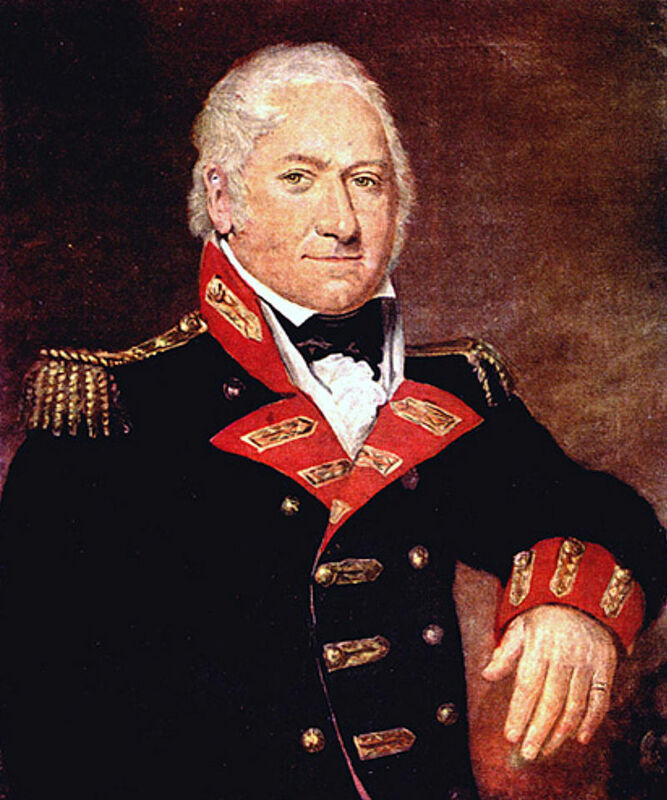 Shrapnel stayed in active service until July 29, 1825 when he retired as lieutenant colonel. Yet the former Royal Artillery officer continued to revolutionize and advance the weaponry used by the British. Nine years after his retirement, in 1834, Shrapnel patented a small arms percussion lock at the young age of 70. Shrapnel would rise to the rank of lieutenant general, even though he was not in active service, before his death on March 13, 1842. However, his shrapnel invention would continue to be a mainstay in the British artillery arsenal. In fact, the same design was used to produce the shells through the First Would War and only discontinued when arms inventions ramped up during the Second World War. This entry was posted in Armies, Personalities, Revolutionary War and tagged Archimedes, artillery, Battle of Waterloo, Duke of Wellington, Henry Shrapnel, Modern Archimedes, Napoleon Bonaparte, shrapnel, Sir John SInclair, spherical shot. Bookmark the permalink. Very nice piece, Phil. Shrapnel’s invention and its effect on the battlefield has always reminded me of the perfection of the proximity fuse in WWII, which took the deadliness of this sort of ordnance to the next level.